Well, I’m getting pretty excited as I finally get things together for the Convention. It’s my first, after growing gesneriads for forty years! 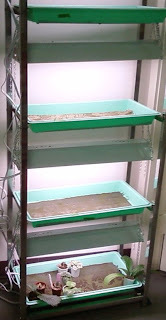 I have to channel all that excitement somewhere, so I have been propagating plants like a mad woman. 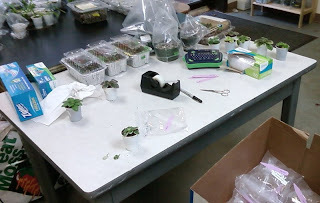 It’s a good thing my colleagues are tolerant, because gesneriads have taken over the lab. I was planting for numbers, so when I read that each scale on a Kohleria rhizome could produce a plant, of course I tried it. I put most of them down in February. Not one has come up in time for the convention, if they ever do come up. You can see them in the background of the plants for the sales table photo, all covered to keep them humid and help them grow fast. I had ordered 50 violet leaves for a workshop I gave in May, so I potted up those that were left for the Convention as well. Next came the leaves. I wish I had not divided my streps in Feb., as most of the individual plants are now small, and many could not afford to lose a leaf, especially because I started as many leaves as possible then. For the last few days it’s been a lot of work getting all the tags in their pots, and packing everything up so it won’t move too much for the drive to Silver Spring. But on the bright side – more shelf space!